After an exciting round of fantasy playoffs, round 2 is expected to bring plenty of fireworks. A lot of teams had to overcome severe odds in round 1, whether that be Gronkowski's suspension, Kamara's concussion, or defeating Le'Veon Bell. Unfortunately, a lot of playoff teams will now be without Carson Wentz, who tore his ACL Sunday against the LA Rams. Wentz was an every-week starter, so this article will feature multiple QB options for those looking to replace Wentz. All of these players are owned in under 40% of Yahoo! leagues. With a few exceptions, previously listed players will not appear. Jonathan Stewart (39% owned) - The Panthers have been using Jonathan Stewart more than usual these past couple weeks. He's averaging a little under 15 attempts the past 4 weeks and has turned that into 100 rushing yards or a touchdown. He did both of those things against Minnesota, rushing for 103 yards and 3 TD's. The Panthers are up against the Green Bay Packers Week 15, who are allowing the 14th most touchdowns per game which bodes well for Stewart. He's a solid FLEX option. 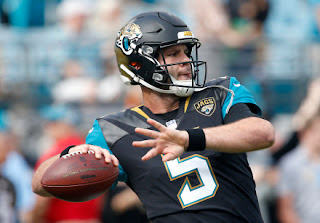 Blake Bortles (36% owned) - Even for teams that didn't have Carson Wentz, Blake Bortles is not a bad option. He's QB7 over the past 3 weeks, and QB9 across the past 5. Bortles has good chemistry with Keelan Cole, Dede Westbrook, and Marqise Lee. He's playing well enough that Jacksonville is looking like a Super Bowl contender! Bortles faces the 4th and 2nd easiest defenses the final 2 weeks and is your best Wentz replacement. Dede Westbrook (31% owned) - Considering he won the Biletnikoff award back at Oklahoma, Dede Westbrook was drafted confusingly low in the draft. He was drafted in the 4th round. There were character concerns, but that doesn't matter to us in the fantasy world. We're looking for production, and that's exactly what Dede has. He's caught at least 5 balls in 3 straight games, and has a dream opportunity against the Houston Texans this week. Westbrook deserves a WR3/FLEX spot on almost any squad. Jimmy Garoppolo (21% owned) - If you can't get Bortles, look for Jimmy G. He's playing much better than his fantasy points say, averaging over 300 yards passing the last 2 games. The issue is that he only has 1 touchdown. The Titans, SF's opponent for Week 15, are not a tough task for Garoppolo. Jimmy G is a good streaming option for Week 15. Trey Burton (8% owned) - Burton has no value if Zach Ertz is healthy, but he certainly does if Ertz is not. Burton is averaging over 18 fantasy points in the 2 games Ertz has missed with 3 touchdowns. If Ertz cannot get cleared before Sunday, Burton is a top-8 option against the Giants' terrible pass defense, even with Nick Foles. New Orleans Saints (40% owned) - Make it your #1 priority to get the Saints' defense this week. The Jets weren't intimidating in the past, but are 10 times less intimidating without Josh McCown. New Orleans already owns a good defense, but this is an elite unit against NYJ. For you DFS players, they're worth every dollar.